A scholar approaches Jesus to test Him with a legal question; Jesus answers with a question Himself. Why? Today we are reading a very well-known portion of St. Luke’s Gospel—the parable of the Good Samaritan. It is fascinating to watch the progression of this episode. It begins with the approach of a “scholar of the Law,” a man who was an expert in explaining the details of the Mosaic Law. He wanted to test Jesus. Why? We don’t know much about this man, but we at least know that his question was not looking for an answer as much as an outcome, although it sounds very noble: “Teacher, what must I do to inherit eternal life?” By this time in His public ministry, Jesus had created an enormous buzz. Even Herod was asking, “Who is this?” (see Lk 9:7-9) Perhaps the scholar was suspicious that Jesus was a charlatan, attracting large crowds out of a large ego. We can assume his question has some element of hostility in it, because Jesus answered it by asking another question, His frequent response to a trap (see Mt 22:15-22): “What is written in the Law? How do you read it?” The quiz of Jesus now turns into a quiz of the scholar. He answers well—love God with all that you are and your neighbor as yourself. Jesus is pleased with his answer. This way of life is indeed the key to eternal life. End of discussion, right? To answer this question, Jesus told a parable. It might help us to know an Old Testament story about some Samaritans, whom the Jews hated as half-breed foreigners and corrupters of true religion, once (hundreds of years earlier) showed great mercy to people from Judah captured in battle. The soldiers wanted to make everyone who survived the battle their slaves, but several Samaritan “princes” protested this brutality. In their kindness, they “assisted” the captives, put them on their “donkeys,” and took them peacefully to “Jericho” (see 2 Chron 28:8-15). Was Jesus drawing on this historical incident to teach about the meaning of “neighbor”? Notice that the two men who “passed by on the opposite side” were caretakers of the Temple and part of the religious elite in Jerusalem (a “priest” and a “Levite”). 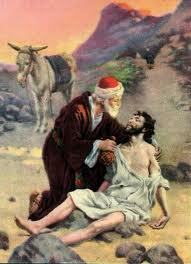 The Samaritan, on the other hand, did all that he could to assist the fallen man. Even our scholar had to admit that he was a true neighbor to the robbers’ victim. In addition to the instruction this parable gives us about loving our neighbor as ourselves, it is also a beautiful metaphor of how Jesus, the “foreigner” from heaven came to save us after the Law of Moses (represented by the priest and Levite), as good as it was, could not. Man, after Adam was robbed by Satan in the Garden and left for dead, needed supernatural healing in order to keep God’s law, which is precisely what the long history of Israel revealed. Jesus comes as the Good Samaritan, with His anointing of the Holy Spirit and the wine of His Presence in the Eucharist, to take us to the inn of the Church for new life. Our Loving Neighbor now makes it possible us to be loving neighbors, too. Possible response: Lord Jesus, please help me have my eyes and heart open to any neighbor who need my love. As Moses was close to death, he exhorted the people of Israel to keep the covenant God had made with them, loving Him “with all your heart and all your soul.” He goes on to tell them that, contrary to the Gospel’s scholar’s notion that definitions and clarifications were necessary before men can do the will of God, “the command that I enjoin on you today is not too mysterious and remote for you.” Jesus makes this exceedingly clear in our Gospel reading. When the scholar wanted more details about what leads to eternal life, Jesus simply told him a story in which everyone (including the suspicious scholar) can recognize a loving, compassionate neighbor. Possible response: Heavenly Father, I excel in making excuses to avoid doing what I know is right and good. Please forgive me. The psalm helps us understand why merciful and compassionate love for those in need lies at the heart of our relationship with God. That is what He is like! “See, you lowly ones, and be glad; you who seek God, may your hearts revive! For the Lord hears the poor, and his own who are in bonds He spurns not.” The Incarnation revealed this kind of Love in all its fullness. We can, therefore, have confidence to sing, “Turn to the Lord in your need, and you will live.” Creatures made in God’s image and likeness will only be truly happy when they live in harmony with God’s design. The commandment to love our neighbor simply puts light on the path to this happiness. St. Paul, in what he writes about Jesus as the “image of the invisible God,” sheds some light on why the scholar’s second question in our Gospel took him in a direction away from eternal life. He wanted to know who was included on the list of neighbors to be loved, which also means who could be left off. Yet here St. Paul describes the dynamic of Divine Love that always, always seeks to unite, even enemies (as it did in the parable). Jesus, in His Body, came to “reconcile all things,” because “all things were created through Him and for Him.” When we contemplate this, our minds begin to touch on truly mysterious heavenly truths. Some have suggested that in the mystery of the Eucharist, we have the first down payment, as it were, that somehow, someway all things—even material things like bread and wine—really are reconciled, made one, with Him. Possible response: Lord Jesus, our world is so full of separation and disunity. It is hard to imagine how it can all be put back together. But love of neighbor is a good start today.